Image thumbnail (from left to right): Finalist Caroline White from Garant and Award Sponsor Bernard Nadeau of BP Canada shaking hands with the winner Catherine Beauregard of RESISTO (a SOPREMA division); the other finalist, André Paquin of MiTek. 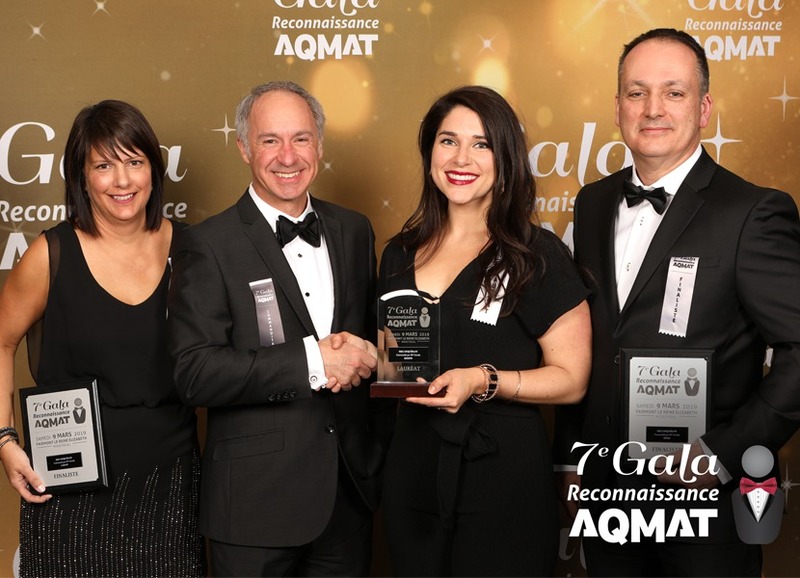 Drummondville, March 20, 2019 – We are proud to announce that RESISTO won the Conquérant (Conqueror) Award at the Reconnaissance Gala held by the AQMAT (Québec Hardware and Building Supply Association). In total, 16 prizes were awarded at the gala, which gathered 500 people at the Fairmont Queen Elizabeth Hotel in Montréal on March 9th. This recognition, presented by BP Canada, honours companies that demonstrate business growth through acquisitions, marketing strategies, or export activities. Over the past year, SOPREMA has reviewed its overall brand image, including its website, packaging and merchandizing. The purpose of this rebranding was to make RESISTO even more well-known and to clarify communications—making life easier for users and supporting them in their projects. Several major industry players attended the event, including senior management of hardware brands and leading manufacturers, service providers and retailers. Six employees and nine companies were honoured, and the product considered the most innovative received an award. In addition, RESISTO presented the “Loyauté – Marchands” (Loyalty – Retailers) Award honouring an employee with 10 years of service or more who helped build customer loyalty and team spirit.